Puget Sound is a transition zone between river and maritime environments. With its complex system of interconnected marine waterways and basins,[i] it is the third largest estuary in the United States, after Chesapeake Bay in Maryland and Virginia, and San Francisco Bay in northern California. In 2009, the collective waters of Puget Sound, the Strait of Juan de Fuca, and the Strait of Georgia were named the Salish Sea by the United States Board on Geographic Names. Sometimes "Puget Sound" and "Puget Sound and adjacent waters" refer to Puget Sound proper together with the waters to the north, including Bellingham Bay and the San Juan Islands region. Marine Protected Areas (MPAs) have existed in Puget Sound since the early 1900s, although most were established after the 1960s. By 1998, at least 102 intertidal and subtidal protected areas existed in Puget Sound; five managed by at least 12 different agencies or organizations at the local, county, State and Federal level. What Challenges Does Puget Sound Face? From the 1960s onwards, Puget Sound suffered serious pollution. Industrial pipes pumped toxic chemicals into the water; dams blocked the way for salmon; natural resources were overharvested. Those problems still persist, but ecosystem management in Puget Sound has significantly advanced since the 1970s and 1980s. In the last 100 years, more than 60 percent of Washington State’s old-growth forest was harvested. Much of the remaining old-growth remnants are limited to relatively high elevation public land. 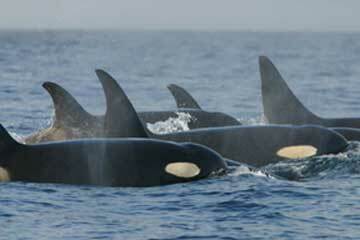 The Southern Resident killer whale population in Puget Sound is actually a large extended family, or clan, comprised of three pods: J, K, and L pods. They are visible throughout the year in Puget Sound, but are most often seen in the summer, especially in Haro Strait west of San Juan Island, the Strait of Juan de Fuca, and in the Strait of Georgia near the Fraser River. How Does Earth Law Differ from Existing Environmental Protections? In most countries, nature has the legal status of property. In contrast, Earth Law argues that nature has inherent rights, and legally should have the same protection as people and corporations. Earth law enables the defense of the environment in court—not only for the benefit of people, but for the sake of nature itself. Earth Law argues that humans and nature are not at odds, but are deeply connected and dependent on one another. Formal recognition of nature’s inherent right to thrive will enable the restoration of balance in the global environment. Our planet’s health depends on this paradigm shift in law, which represents the next evolution in environmental protection and conservation. The Marine Mammal Protection Act (MMPA-1972) places a moratorium on the “taking” (hunting, harassing, capturing, or killing) of marine mammals in US waters. The MMPA was enacted in response to increasing concern among scientists and the public that some species or stocks of marine mammals may be in danger of extinction or depletion caused by human activities. Earth Law can further the effectiveness of the MMPA. Earth Law gives formal recognition to the rights of marine mammals. Additionally, legal rights will affect the enforcement process by giving the marine mammals standing to sue; furthering their protection and effecting protective and restorative activities for species. The Whale and Dolphin Sanctuary in Uruguay provides an example of how Earth Law can benefit Puget Sound. Established as a marine protected area in 2013, the Sanctuary needed a management plan to enforce the legislated protections. Uruguay’s largest multi-use protected area, the Whale and Dolphin Sanctuary was established in 2013. The campaign for legal rights has been promoted alongside the #OceanoSanos (#HealthyOceans) campaign that seeks to protect the country’s marine environment by promoting responsible fisheries and preventing illegal, unreported and unregulated (IUU) fishing. Creating a sustainable relationship with the ecosystem and species within it. Making whale and dolphin protection a legal responsibility; notably the Southern Right Whale and the Franciscana dolphin, an IUCN Red List Species. Reviewing activities such as port construction, fishing and vessel traffic for their impact on the sustainability of the Sanctuary. What Would Earth Law for the Puget Sound Look Like? Incorporating Earth Law into existing and new marine protected area governance can enhance and restore both the ecosystem of the Puget Sound as well as preventing the extinction of the Southern Resident whales. There exist multiple pathways for rights of nature to protect the Puget Sound and its species. Pass a law recognizing the Southern Resident whales as legal entities, with all the rights of a legal person. Action to protect the three pods of the Southern Resident whales could address the high pollution of Puget Sound and provide legal recourse to stop commercial discharges. Incorporate rights of nature into existing marine protected area management plans. Create new marine protected areas in the Puget Sound, forming an extensive network that represents all ecosystems and critical habitats. Designate the whole Puget Sound as a marine protected area with legal rights also protecting the species within the complex estuarine ecosystem. Incorporate rights of nature into the proposed whale protection zone, through its originating statute and management. Adopting a holistic, rights-based and systems-approach to managing human activities, taking into account the clear land-sea connection. Earth Law offers a new solution to protect and sustain the Puget Sound—one that balances human and environmental needs in a way that allows all species to coexist in harmony. What Can I Do About Getting Rights Recognition for the Puget Sound? [xi] “Marine Mammal Protection Act,” Marine Mammal Commission, 2017, https://www.mmc.gov/about-the-commission/our-mission/marine-mammal-protection-act/. [xii] “Optimum sustainable populations” replaced “maximum sustainable yield,” which sought ensure that species replenish themselves for an adequate harvesting subsequent years, as the grounding principle of US resource management approach. [xiii] “Marine Mammal Protection Act Fact Sheet,” National Oceanic and Atmospheric Administration, updated May 10, 2016, http://www.nmfs.noaa.gov/pr/laws/mmpa/. [xv] Trees, supra at 57. [xvi] 16 U.S.C. 1374 § 104(d)(6). [xvii] Trees, supra at 37. [xviii] Environment Guide, Benefits of marine protected areas (Sept. 1, 2017), http://www.environmentguide.org.nz/issues/marine/marine-protected-areas/; OECD, supra. [xix] Hoyt, supra at 51-54. [HG1]Is it better to say federal MPA system? Newer PostHow Can Earth Law Save Florida?